Last week ended in a test of endurance for the Turkey Valley girls’ basketball team (12-6, 10-3 UIC) as it played three games in three days, taking the “W” in all three. Following a week of snow and cold, the Trojans needed some big plays to hold off Central (11-8, 8-6 UIC) Thursday night at home, 49-42. TV held the advantage from start to finish with a slim 25-21 halftime lead. A solid 16-point third quarter gave the Trojans enough advantage to hold off the Warriors’ come-from-behind charge in the fourth. Katlyn Baumler and Kara Reicks were double figures for the Trojans. Baumler had 13 points and six rebounds while Reicks added 10 points. Breanna Busta hauled in nine rebounds, while Jaycie Byrne grabbed five steals. Players, coaches and fans may still be trying to process what transpired on the Trojan court Saturday night, as TV overcame a big deficit and three overtimes to topple Kee (13-5, 9-4 UIC), in the thriller, 61-57. It was a low-scoring affair in the beginning. The teams were tied 6-6 after the first quarter. In the second frame, the Hawks gathered the momentum to take a 22-13 halftime lead. The home squad showcased more spark in the third quarter to no avail against Kee, who only added to its lead 35-23. Falling behind by as many as 15 points early in the fourth period, the Trojan intensity showed up. After the Hawks scored first in the final quarter, TV went on a 7-0 run and continued to find the open shot to pour in 20 points in the fourth to tie the score at 43-all at the end of regulation. Neither squad caved under the pressure of the first or second overtimes. With 30 seconds left in the first overtime Kee held a 47-45 advantage when Jordan Lukes was sent to the charity stripe, sinking the first free throw and missing the second. Katlyn Baumler came up with the big offensive rebound and was fouled on the putback to be sent to the line. The junior connected on the first of the two free throws to knot the score at 47. As the Hawks drove down the court and looked to score, the Lady Trojans came away with a steal but ran out of time to get a shot off. Sitting on top 55-52 in the second OT, the Trojans saw Kee’s MaKayla Walleser drive the length of the court and find Katie Brennan for an open trey to force the third overtime, 55-55. The game on the line in the third extra period, freshman Kara Reicks dropped in a free throw with 13.1 seconds to put TV on top 60-57. With Kee looking to score, Breanna Busta got a hand on the Hawk shot for a block as Baumler grabbed the loose ball, was fouled and sealed the win with a free throw for the 61-57 victory. “We displayed a lot of composure and growth in the extra 12 minutes as the girls turned around the performance against a team like Kee,” noted Nymeyer proudly. Baumler came through with 20 points and 15 rebounds for the Trojans. Kara Reicks came off the bench to score 18 points and grab eight rebounds. Byrne had nine points and four steals. 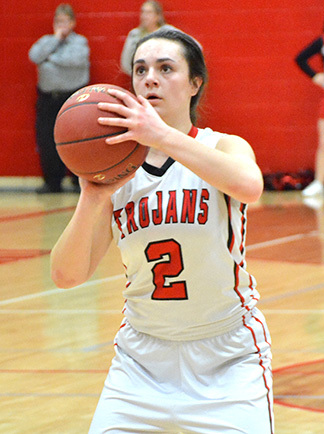 Working to make up multiple games from the recent schedule interruptions from weather, the Lady Trojans hit the court at MFL MarMac Monday. Tonight (Tuesday, Feb. 5), TV packs the gym bags again and head to Clayton Ridge for a 6:15 p.m. tip-off. The postseason gets underway for Turkey Valley at home Thursday, Feb. 7, against West Central at 7 p.m. Please fill out the form below to submit a comment. All comments require approval.